Find the trusted computer repair team at CATCOM COMPUTERS in Montclair, NJ when your computer is acting up. 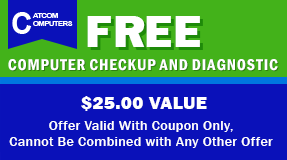 We can perform diagnostics to keep your machine running. Our team specializes in fixing PCs and Macs; also, we offer additional support for Lenovo™ machines. to keep old machines running. Need IT Services in Montclair, NJ? Call CATCOM COMPUTERS today! We do data recovery from USB mwemory sticks, PC laptops and desktops, Apple Computers and Iphones. We remove adware and spyware from PC and Mac for a flat rate. Call CATCOM COMPUTERS or stop by our store. Catcom Computers also offers smartphones and tablets repairs as well as Macbook Liquid Spilled Repairs for a flat rate! Whether you need a computer diagnostic or a virus removed, the PC and Apple Computer IT staff at CATCOM COMPUTERS in Montclair, New Jersey, is your answer. Our computer repair store offers a variety of different means and methods to keep your machines running smoothly. With over 35 years of business experience, our certified computer technicians do upgrades and repairs on a number of different computer makes and models. We are also skilled in the repair and servicing of out-of-warranty and vintage computers. CATCOM COMPUTERS is dedicated to helping your firm use information technology as a formidable competitive weapon. Learn More about CATCOM COMPUTERS, INC. Contact us to learn more about our PC and Apple Computer support that we have at our computer repair store.